… is on again! Like the name states, Micropop week is a series of independently produced “micro” shows all over Düsseldorf happening April 6th to April 13th. I’m playing twice: my show-show is on Sunday April 7th at Cafe Knülle (Oberbilker Alle 24). Starts 20:00, ends 22:00. Also playing, Jack Devaney and Naima. A stellar night of singer-songwriter goodness, to be sure. Love to see you there! That’s it really, but you can find more info on my live shows page. 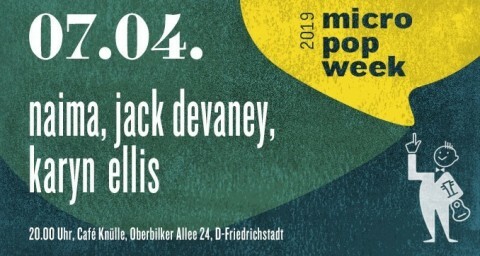 Be sure to check out the Micropop Website for details about ours and many other shows happening around Düsseldorf this week!